Planning is a thinking and silent process which appearance is every where in the organization and concerned to future functional procedures and goals and objectives. Planning is the deciding in advance what is to be done in future. Planning is the blue print of the course of action to be followed in future. Planning is advanced decision making of what is to be done; how, when and where it is to be done; who is to do it and how results are to be evaluated. Planning is thus looking ahead and preparing for the future. a successful enterprise depends on real plan. 1. First step of managerial function. 2. It is a thinking process. 3. It is a silent process. 4. It is concerned to future functional procedures. 5. It is concerned to goals and objectives. 7. It’s area is every where in the organization. ** What are the qualities of a good plan? 6. Indication to direct the perfect way. 7. Proper utilization of resources. ** Steps of planning are very important for making proper plan, so express it at the perfect way. 1. To evaluate the future opportunities and disfavouring in light of present position. 2. To determine the particular aim, goals and objectives. 4. To make an idea about future. 5. To find out the alternative courses of action. 6. To evaluate the alternatives. 7. To select the best. 8. To make supportive plan. 9. To determine the time. Sequence and procedures. 10. To apply the pilot plan. 11. To evaluate and rectify the plan. ** Various types of plan with a diagram. 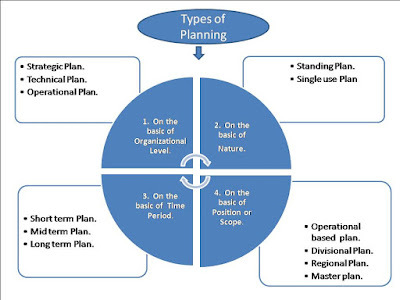 Figure : Showing Types of Planning. Strategic plan means such long term plan which is made for achieving the goals and objectives in the perfect competitive market. Technical plan is the plan aimed at achieving the the technical goals and is developed to implement part of strategic plan. It is involved with upper and middle management. Operational plan is the short term plan which is made out at the various stage of organization for implementing the technical plan. The plan which is made for repetitive using in the organization. The plan which is made for one time using in the organization. Short term plan which is made for less than one year duration. Mid term plan is a plan which is made for minimum one year and maximum 5 years duration. Long term plan which is made for more than 5 years and from 5 years to uncertain duration of time. The plan which is made for performing the particular operation or job is called operational based plan. Divisional plan which is made for particular division of an organization is called divisional plan. Regional plan which is made for a particular or specific region of an organization is called regional plan. This is the main plan of an organization. It is the combination of all plars. Without it, the existence of an organization can not be imagined. Decision making means Selecting the best among alternative courses of action. Other wise, decision making means accepting the right things in the right time at the right place. ** What is controlling? What are the steps/processes of controlling an organization? This laser machine is looking so progressed and supportive. Like you said in this article it is so subject with best essays and simple to utilize and as indicated by me, this machine is so wonderful and accommodating in the distinctive field. It is the machine of things to come.